Home » 1930s » >Blouses! >Well, unfortunately this weekend I’ve caught a cold- like apparently most of the rest of the nation. It has, however, given me sporatic spurts of sewing simple things or finishing up things. 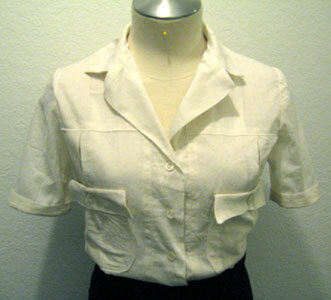 I have made several blouses to round out my 30s wardrobe. I love seperates and the sporty look. Even though I might technically be too old for “collegiate style” I still love it and I don’t care! This one I made when I was feeling the most poorly- and you can tell. My husband said “honey, you shouldn’t sew when you’re sick”. Apparently that’s what I tend to -do- when I feel crappy., thinking of other colds I’ve had last year. Sewing is nurturing to me, somehow- even if it’s sitting and hand stitching, and unless I’m down and out dying- I’ll probably be taking spurts of sitting on the couch with my kitty and watching movies and going back to the machine. Then when I feel crappy again I’ll repeat. Ha. Does anyone else do this or am I just crazy? I HATE sitting still with nothing to do. I’m either sketching or knitting or counting old pattern pieces or hand stitching or quilting, or zoning out and sketching costumes in old movies that are playing, but I rarely just SIT. 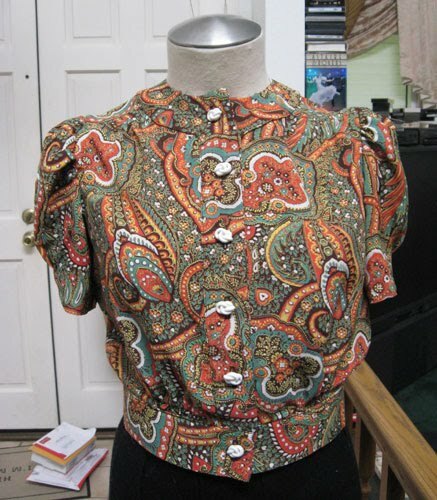 Here’s the pattern for the first and second blouse, since I’ve gotten so many questions on it! 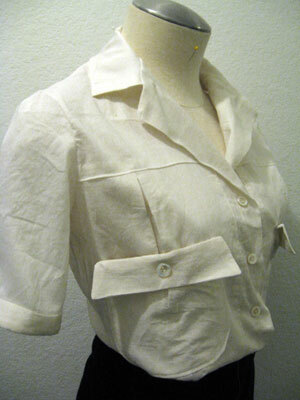 This one was a recent pattern find on Ebay, and I made it up in an off white silk for a dressier look under suits and the linen for a more sporty look. It was supposed to be Simple-to Make- and it kind of was- but probably not for modern sewers. This pattern is probably from around 1935. I think Paisley’s one of those prints you either love or hate. Kind of like Polka Dots. 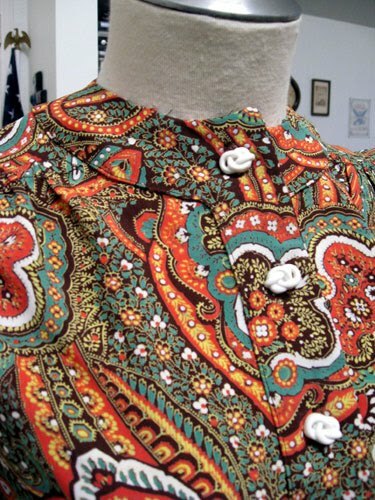 I love paisley- as long as the print’s not 70s looking. This one is a vintage rayon print, and it kind of reminds me of the print of one of Ilsa’s blouses in Casablanca. Unfortunately I didn’t have enough to make that one up- just enough to squeak this one out. 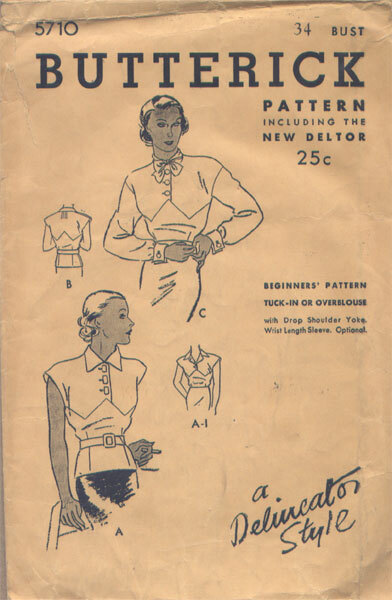 This is from a vintage pattern from 1940. I guess that’s all to report here. Hope everyone has a lovely Halloween! >It stinks that you're feeling under the weather, but I love everything you've been able to make! Especially the second blouse. :)Ihave trouble sitting still as well! I always need to be doing something with my hands or my mind will wander (or I'll physically get up and wander! )Get well soon! >I caught the cold too, then it turned out to be swine flu.. ugh. I am glad you were productive.. I slept for days.Hope you feel better soon! >Thanks, gals!AlohaAroha, that's so neat that you teach a class all on paisley! That's a class I'd love to take :)Twila Jean, Oh my gosh- I hope you're ok now! You're the first person I've known who's gotten swine flu. Feel a lot better!Sonia, thanks so much! I'm flattered you want to link me from your blog :) Thanks! >The first pattern is super cute! I think the details get kinda lost in the silk, maybe not in person and it will be great under a suit. I would wear the sporty look today.Would you be so kind as to put up the pattern numbers? 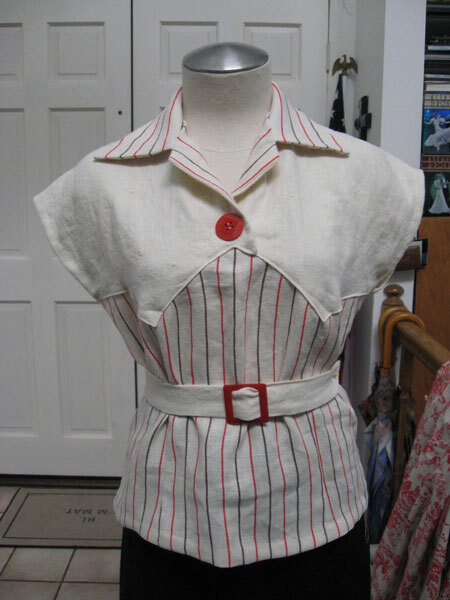 >I know it's a few months since you posted these but I LOVE the white blouse- would you be so kind as to put the maker and pattern number up so I could find it. >Hi again,I like the first one but actually meant the adventure blouse- I like the big pockets!